The CBCF has awarded scholarships to talented and deserving students for nearly three decades. Each year, we award more than 200 scholarships to students across the United States. Recipients demonstrate leadership ability through exemplary community service and academic talent, while other received need-based scholarships to reward their persistence in pursuing a quality education. Our scholarship programs support current or upcoming college students across a variety of disciplines. Selected applicants will be constituents of a CBC member’s district. To determine your Representative, enter your permanent address zip code here. Qualified applicants must be currently enrolled full-time in an accredited academic institution, and have a minimum 2.5 GPA on a 4.0 scale. Access to the online application will be accessible on this page once opened. Seeing an educational need in their congressional districts, the CBC Spouses Education Scholarship was established in 1988 by the spouses of Congressional Black Caucus members in response to federal cuts in spending for education programs and scholarships, which disproportionately affect people of color. This opportunity awards scholarships to academically talented and highly motivated African-American or Black students receiving an associates, undergraduate, graduate, or doctoral degrees. 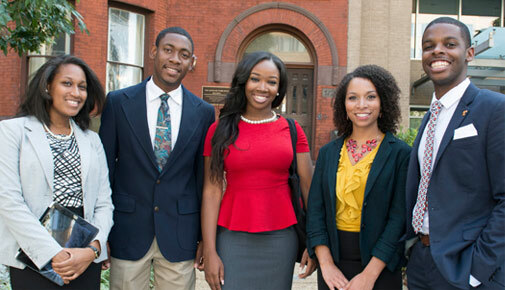 The Congressional Black Caucus Foundation’s Louis Stokes Health Scholars Program, sponsored by the United Health Foundation, seeks to increase the number of qualified, competitive African-American or Black students entering the health field. This program offers a scholarship award to offset scholars’ cost of attendance. The multi-year award supports these scholars throughout their undergraduate and graduates academic journey. Qualified applicants must be currently enrolled full-time in an accredited academic institution and have a minimum GPA of 3.0 on a 4.0 scale. Applicants must be pursuing an undergraduate or graduate degree in a health-related field, and be a U.S. citizen or have permanent U.S. residency, and desire a qualifying primary health care profession. Access to online application will be accessible on this page once opened. Each year, CBCF invites qualified African-American and Black junior and senior high school students from the districts of Congressional Black Caucus (CBC) Members to participate in the Essay Contest and Issue Forum. Students are presented with a topic that embodies some of our communities’ most pressing issues and asked to write an essay to defend their research, analyses, and opinion. Submissions are judged by a special committee of CBC Spouses. First place winner will receive $1,500; second place will receive $1,000, and third place will receive $750. Winners and their families are also invited to Washington, DC in September to accept their award and attend a panel discussion on the topic during the CBCF 49th Annual Legislative Conference. To determine your Representative, enter your permanent address zip code here. Access to online application will be accessible on this page once opened. Have some questions about scholarships? Please visit our FAQ page for details on applying for our scholarships. For general information, contact scholarships@cbcfinc.org or 202-263-2800. Please note: Immediate relatives (defined as one’s parents, step-parents, siblings, spouse, children, step-children, foster children, in-laws, sibling in-laws, grandparents, great grandparents, step-great grandparents, grandchildren, aunts, uncles, nieces, and nephews) of a CBC Member, a CBC Spouse, a staff person of a CBC Member or Spouse, CBCF staff, a member of the CBCF Board of Directors, Member of CBCF, Corporate Advisory Council Member of CBCF, or any CBCF-sponsoring entity are not eligible for CBCF scholarship programs.